An intriguing aspect of the WikiLeaks saga is the story behind the arrest and public unmasking of Private Bradley Manning. 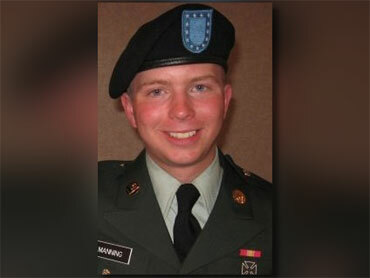 In late May of last year, Manning was arrested by the Army's Criminal Investigation Division. At the time, he was stationed in Iraq at Forward Operating Base Hammer, 40 miles east of Baghdad. Just 22 years old, Manning was an intelligence analyst, and while he wasn't immediately charged with any crime, the Army had reason to believe that he was involved in leaking classified information to Julian Assange and WikiLeaks. Just one month earlier, WikiLeaks had posted the gun-sight video of a 2007 U.S. helicopter attack in Iraq which the site titled "Collateral Murder." It was the first high-profile leak in what would become a sustained campaign by WikiLeaks against the American government. With Manning in custody, the Army was trying to figure out the scope of his offenses when, in July, WikiLeaks released a compendium of 77,000 American military documents relating to the war in Afghanistan. The Army believed that Manning was behind these leaks, too. In the course of their investigation, they discovered that Manning had downloaded 260,000 State Department cables from the Net-Centric Diplomacy database on SIPRnet. When WikiLeaks published these documents in December, Manning was suspected of having handed them over as well. The public first learned about Manning's arrest not from the New York Times or the Washington Post but from Wired.com, the sister website to the magazine Wired. The scoop came from reporters Kevin Poulsen and Kim Zetter. And here's where the story gets interesting. In the late 1980s, Poulsen was a computer hacker. Under the nom de guerre "Dark Dante," Poulsen accomplished a number of inventive, if not strictly legal, feats. As a 17-year-old he allegedly hacked his way into the Defense Department's ARPANET. He later hacked private corporations, such as Pacific Bell, and various federal systems, where he uncovered information about ongoing FBI investigations. This was enough to get the feds after him; he was indicted in 1989. At the time, the Department of Justice's cybercrime unit, which rode herd on Poulsen's case, was headed by a fellow named Mark Rasch. With the FBI at his heels, Poulsen went on the lam for 17 months. During his run, he hacked into the phone system of a Los Angeles radio station, 102.7 KIIS-FM. He took control of their phone bank and used it to win various contests by arranging things so that he could always be the 102nd caller. His fabulous prizes included a Porsche 944 S2, a vacation to Hawaii, and $20,000 in cash. When Poulsen was featured on the true-crime TV program Unsolved Mysteries, the show's 1-800 tip line was mysteriously disabled. The fun ended in April 1991 when Poulsen was arrested at a supermarket in Sherman Oaks, at 10 o'clock at night. In 1994 he pled guilty to an array of charges, including wire and computer fraud. He served a total of five years in jail. Upon his release, Poulsen became a journalist. He wrote first for Security¬Focus, a website dedicated to information and cybersecurity. Oddly enough, one of SecurityFocus's other contributors was Mark Rasch, who by that time had left the Justice Department and gone into the private sector. Poulsen has become an enterprising-and quite excellent-reporter. He occupies an unusual position in journalism, possessing not only an enormous amount of technical expertise, but also contacts in both the reformed and unreformed hacker worlds. In 2000, Poulsen was working on a piece about security issues at AOL when he interviewed a hacker named Adrian Lamo. As Poulsen later explained, "Lamo was nearly unique among hackers of that period, in that he had no evident fear of discussing his unlawful access, regardless of the inevitable legal consequences. He cracked everyone from Microsoft to Yahoo, and from MCI to Excite@Home. And he freely discussed how he did it, and sometimes helped the victim companies close their security holes afterward." Over the years, Poulsen and Lamo became friendly, with Poulsen frequently using Lamo as a source. In May 2010, Poulsen wrote a story for Wired.com about Lamo's having been institutionalized for Asperger's syndrome. The piece was read by Private Manning in Iraq and it struck a chord; he immediately reached out to Lamo and initiated a series of online chats and emails. It was during the course of these conversations that Manning confessed to Lamo that he had given a mountain of classified material-including the "Collateral Murder" video-to WikiLeaks. Lamo was a hacker who operated on the fringes of the law, but he knew the difference between computer crime and offenses like Manning's that could get people killed. He was troubled by what Manning had told him and consulted some people in cybersecurity. One of them was Chet Uber, the head of a rag-tag volunteer group, Project Vigilant, which attempts to (legally) compile evidence of cybercrime and forward it to the authorities. Uber asked Lamo to talk with Rasch, who is listed as Project Vigilant's general counsel. (There is some dispute as to how serious Project Vigilant is; Rasch demurely describes the group as mostly "aspirational.") Both Uber and Rasch urged Lamo to give his chat logs to the FBI. On May 25, he met with FBI agents at a Starbucks near his house in Carmichael, California. The entire affair lasted barely a week: Manning reached out to Lamo on May 21 and was arrested within days. Lamo told Poulsen about his contact with Manning, and Poulsen, after Manning was taken into custody, convinced Lamo to give Wired.com a copy of the chat logs and to go on the record. Kevin Poulsen, with his only-in-America journey from computer prodigy, to dashing hacker, to jailbird, to stud journalist. It's Private Bradley Manning, who sits in the brig at Quantico facing eight federal criminal counts related to the mishandling of classified information. The left, both here and abroad, has turned young Manning into a cause célèbre. Like some latter-day Mumia Abu-Jamal (or Julius and Ethel Rosenberg), Manning is being held up as a brave voice of morality and defiance, victimized by corrupt forces of "digital McCarthyism." In December, the city of Berkeley took up a resolution to have him declared a "hero." Michael Moore regularly posts information about pro-Manning rallies on his website. The Nation's blog recently urged readers to remember that "without Bradley Manning and many others like him, Julian Assange and WikiLeaks and all our new-found public information would be as in the dark as Manning is right now." The Bradley Manning Support Network has sprung up to collect followers and money for his defense fund. Through their website, BradleyManning.org, you can donate cash or buy "Free Bradley Manning" T-shirts, buttons, and whistles or watch Julian Assange, on Al Jazeera, call Manning an American political prisoner. Other lefties, such as Salon.com's Glenn Greenwald, have actually attacked Poulsen and Wired.com for bias, journalistic malpractice, and assorted conspiratorial evildoing.That's crazy, of course. But for these people, all reality is filtered through the lens of politics. For them, Manning and WikiLeaks are players in a grand opera about the moral depravity of America, so they must be defended and their antagonists must be attacked. The funny thing is, Poulsen isn't particularly an antagonist. He's just a good reporter working a great story.